Below the dam at Troy, river flow is no longer the dominant agent of motion of the Hudson River. Owing to the particular suite of geological processes that have sculpted the landscape of the Hudson Valley, the river's shores in Albany are virtually the same elevation as those at the mouth. As a consequence, the tide extends 250 km up the river to the dam at Troy. River flow produces a net southward motion in the tidal river, but tidal velocities are usually much higher than the net southward motion due to river flow. Thus, in all but the most extreme outflow conditions, this part of the river flows in both directions, following the influence of the tides. where g = 9.8 m s-2 is the acceleration of gravity and h is the average water depth. In the Hudson the average depth is about 10 meters (m), so c ~ 10ms-1 (approximately 20 knots). Frictional effects slow the tide down by about 20 percent to 8 m s-1 or about 16 knots (DiLorenzo et al., 1999). Thus it takes six hours for the high tide to propagate from the Battery to Catskill, 185km to thenorth. 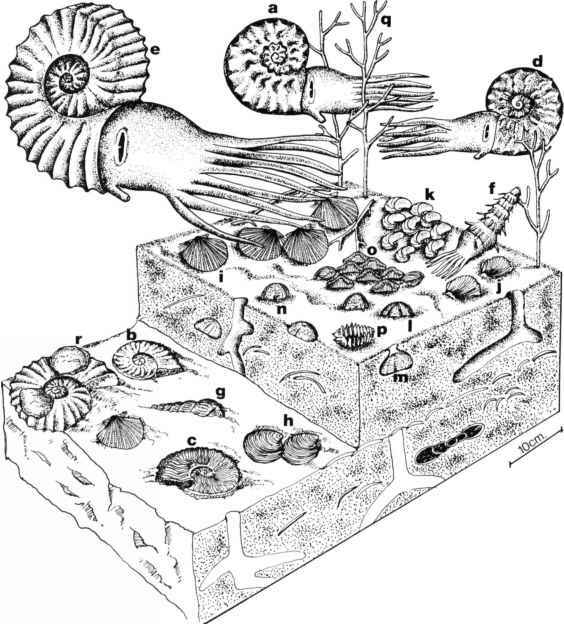 (Fig.3.3). Figure 3.3. 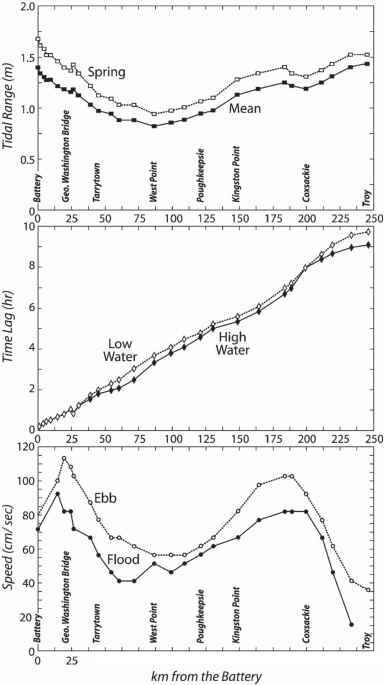 Tidal propagation conditions in the tidal portion of the Hudson River (adapted from DiLorenzo et al., 1999). The tidal wave is essentially a progressive wave, as indicated by the time delay as it propagates up the river. Tidal currents are quite energetic through most of the length of the tidal river. Figure 3.4. 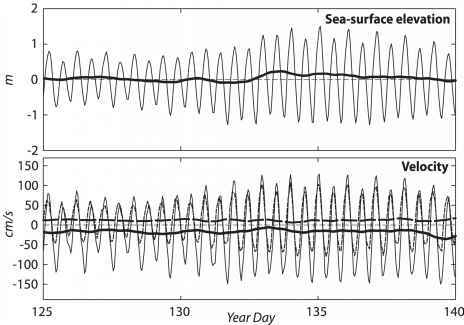 Time series of tidal elevation and currents in the lower estuary (near the Battery) in the spring of 1999. The upper panel indicates the tidal (thin line) and low-frequency (thick line) variations of sea level. The lower panel shows near-surface (solid) and near-bottom (dashed) currents, again indicating tidal (thin lines) and low-frequency (thick lines). the dry summer months and reaches 0.2-0.5 m s-1 during the spring freshet. Thus, the tides provide most of the energy and fluid transport within the river below the dam at Troy. The progressive wave character of the tide in the Hudson has an interesting influence on the phase of the currents relative to tidal height. In most tidal environments, slack water occurs close to high and low tide. However, in tidal rivers like the Hudson, maximum flood occurs within an hour of high tide, and the flood continues for the first two hours of the falling tide. As the tidal wave in the Hudson approaches the dam at Troy, it becomes more like a standing wave due to the reflection of the tidal wave at the head of tide. The tidal forcing varies due to changes in the phase of the moon as well as other variations in the relative positions of the earth, moon, and sun. The most prominent of these occur at fortnightly and monthly time scales. These variations cause the tidal range at the Battery to vary from 1.2 m during small neap tides to almost 3 m during large spring tides (Fig. 3.4). The variations in currents are more complicated, due to changes in vertical structure of the flow as well as the influence of the salinity structure. Near-surface currents vary from around 0.7 m s-1 during neap tides to 1.3 m s-1 during the strongest spring tides. Near-bottom currents are considerably weaker, due to the frictional effects of the bottom boundary layer. These spring-neap variations in tidal flow have a profound influence on the estuarine regime, and likewise the estuarine circulation affects the strength of the currents, as explained in the next section. The Hudson River estuary is an unusual hybrid of estuarine types, with elements of fjord, salt-wedge, and coastal plain estuaries. Glacial scouring of the Hudson Valley during the Pleistocene Epoch yielded a long, deep trough, which became a series of lakes dammed by glacial moraines during the retreat of the glaciers. When those moraines collapsed and sealevelrose, the Hudson valley became a fjord, with depths of possibly as much as 200 m in the vicinity of the Hudson Highlands, where the bedrock was deeply gouged by ice (Worzel and Drake, 1959). Seawater filled the deep basin, and the freshwater outflow was confined to the surface layer. Tidal currents within the estuary were weaker than at present because of its great depth. This fjord environment was a nearly perfect trap for sediment, because neither the river outflow nor the tidal currents provided adequate energy to move sediment after it settled to the bottom from the turbid, surface layer. Sedimentation over the last 10,000 years has filled this glacial trough, and now the Hudson has depths of 10-15 m, more typical of coastal plain estuaries than fjords. As the Hudson estuary got shallower, its hydrodynamics were significantly altered. Tidal currents became stronger, finally reaching their present values of around 1 m s-1. As the tidal currents increased, the mixing between the freshwater outflow and the seawater increased. No longer could sea water penetrate far into the Hudson valley, due to the combination of tide-induced mixing and freshwater outflow. The present regime in the lower Hudson is a partially mixed estuary, with vigorous, tide-induced mixing between fresh and salt waters. The seawater is progressively diluted by river water as it extends up the estuary, and even during low flowconditions the water is nearly fresh at Peekskill, 70 km to the north of the harbor.